On July 17th, 2018, North America, Central America, and South America Associates will receive an email containing the grand total of Cruise Points earned in Max The Americas’ first-ever Cruise To Convention promotion. Use these Cruise Points to claim a cabin on-board the Allure of the Seas — the spectacular cruise ship and gathering location for the most anticipated Max Convention event yet! As Cruise approaches, it’s time for a special, one-hour broadcast call with all the important details, rules, regulations, and more. Associates MUST earn and/or purchase the cruise through Max in order to participate in the Max Convention events and festivities. 8500 is the minimum amount of points needed to earn a cruise cabin. 8500 points are enough points to exchange for (in lieu of paying anything out of pocket) an inside cabin for two persons. The maximum allowable earned points an Associate may use is 12,000. Associates who earn 8499 points and under can apply the value of their existing points to the cabin fee and pay the remainder of cabin cost in USD funds. 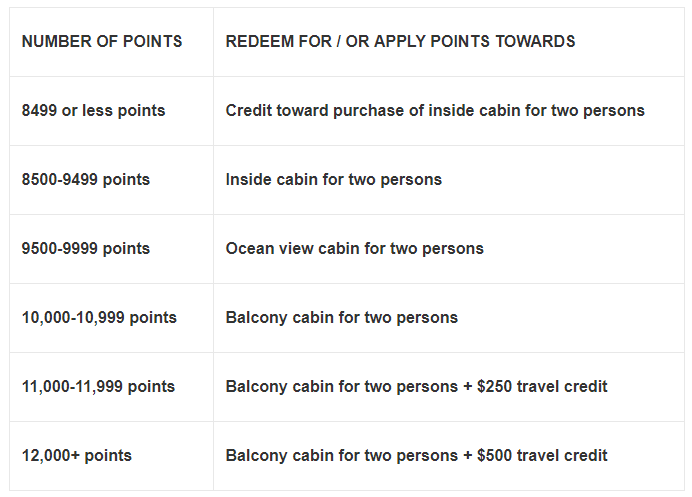 If you have achieved the points required for any of the requirements listed above (not including the cash awards), you can pay the difference between points earned and points required multiplied by $.25 to be eligible for the upgraded cabin (subject to availability). If your points total 8499 or fewer, then use the following formula to calculate the amount you will pay in USD to make up for the equivalent point-value difference in the cost of the cabin. Subtract total points earned from 8500. Note the amount / difference. Multiply the amount in step 1 by $.25 (25 cents, USD). The amount calculated in Step 3 is the amount of USD monies you can pay (combined with your Points earned) to receive an inside cabin for two that will be considered paid in full once Cruise points and monetary difference are officially claimed by you and put towards the cabin. Therefore, all you have to pay is $375.00 plus your points earned when you submit your claim to secure your cabin. Deluxe room accommodations for two persons aboard the Royal Caribbean Allure of the Seas. Entertainment that includes Broadway musicals, ice-skating spectaculars – plus thrilling casino action, live comedy and music, bars, clubs and much more. Activities: Swimming, Shopping, Simulator Surfing, Spa Visits, and more! All taxes, port fees and charges, and gratuities. This Max International The Americas 2018: Cruise to Convention is poised to be the grandest, most spectacular, legendary event in Max history. The excitement and anticipation continue to build. As our success increases and our global expansion grows, Max’s positive energy keeps gaining Momentum!